The late great coach knew all too well that time, (as well as money and scope) can be your friend or enemy in any game or project! Where would you begin? How would you scope the effort? How long would it take? How much would it cost? You couldn’t imagine how to approach ANY of the project’s triple constraints. The key rests within your internal operating structure. You cannot effectively transform your company unless you transform the way you operate and that begins with your PMO. A recent Forrester report states that the primary reason companies fail in their transformation efforts is because they start by launching departmental efforts in marketing, eBusiness, or technology management and bolt them onto the existing businesses. The “digital bolt-on” approach can deliver tactical results, but the strategic reality is that your business needs a reset. You need to look at digital holistically. You need to transform your business by applying digital thinking across everything you do. In short, you must become a digital business. For many organizations, the biggest barrier to digital transformation is cultural resistance. It will often be tough to see beyond the pain of transformation and understand the tangible benefits of digitizing operations. At the very least you are likely to encounter a lack of commitment to change, and you may come up against significant resistance. While, the responsibility of delivering digital transformation may ultimately fall on just a few people, it always requires the support of many stakeholders, including the C-Suite. So, your strategy for overcoming resistance should be based on evangelizing the benefits of digital operations. You can do this by focusing your initial efforts on one area where you can make a quick win. By digitizing and improving a simple business operation that touches many parts of the organization, you can illustrate the benefits without risking any disruption of critical day-to-day operations. 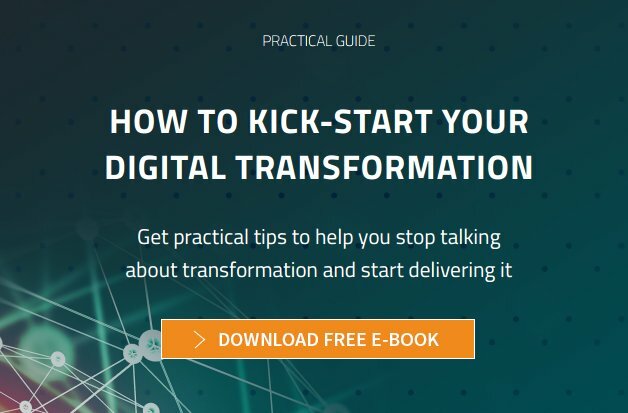 Once you’ve demonstrated the power of digital transformation, your organization will have a better understanding of what digital transformation really is, you’ll have stakeholders on your side, and you’ll have experience of automating processes in a digital platform. So now it’s time to repeat your success, and think bigger. Now it’s time to really innovate. The most important step is to align your digitization initiatives with your overall business strategy. When you have answers and ideas you’ll know where you need to apply your efforts. Once you know that, through the application of rigorous procedures you can rapidly deliver digital solutions again and again. Digitizing individual processes in individual business units is only the start of digital transformation. Real, customer-centric digital transformation is enterprise-wide. So, at this stage your challenge is to make sure that your newly created culture of digital innovation extends to the farthest reaches of the organization, influencing the operations of the entire business. Digital Platforms – the right agile technology platform will enable a unified approach to the digitization of your entire business. This platform can be centrally owned by IT, but managed, controlled and customized by individual business units. Centers of Excellence (CoE) – many successful digital leaders build a CoE to drive enterprise wide digitization. The CoE exists to provide best practice, training and support that aligns with an overall strategy and vision for digitizing the business. So, when your CEO comes to you with what once seemed to be an insurmountable task, you will take on the assignment with ENERGY, no doubt you will be EMPOWERED to take the task head-on coming from the top, and you will successfully EXPAND the transformation across the enterprise! Next articleRobots versus Humans, Who Will Win Out?